Astronauts didn't get a big turkey and mashed potatoes -- but lots and lots of goop. Astronauts celebrated Thanksgiving aboard the International Space Station on Thursday — albeit in a very unconventional fashion. Scott Kelly and Kjell Lindgren, the two American astronauts on board, got a welcome day off from hours of experiments, according to a Washington Post report. But they didn’t get to roast up a giant turkey with stuffing or whip up some mashed potatoes. Instead, they got smoked meats and bags of mush — a treat nonetheless. Still, the meal resembled the familiar Thanksgiving fare of smoked turkey, candied yams, corn, and potatoes au gratin. Kelly is in the midst of a year-long mission on ISS, a record for a NASA astronaut. He has an identical twin brother, Mark, who is also an astronaut, and he tweeted him a picture of his feast back on Earth — perhaps to as a friendly little taunt. 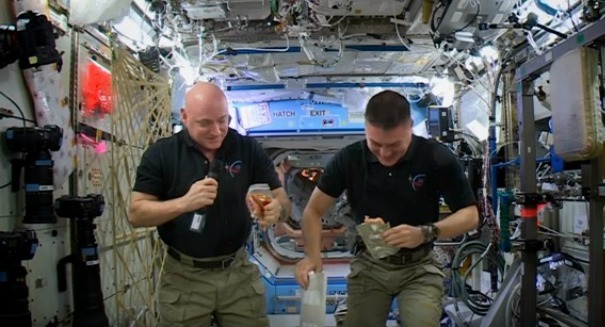 With fewer than 100 days left in his mission, Scott Kelly will be able to enjoy food on Earth fairly soon. The two brothers are undergoing tests throughout the year so that NASA can compare the two of them and see the effects on space in order to better understand how it impacts the human body.